You will get information about Punjab public service commission PPSC announced written test date and exams schedule for February. 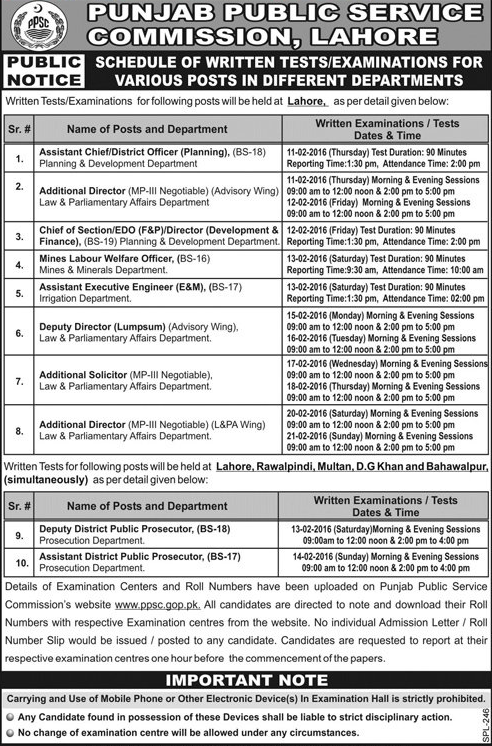 Punjab public service commission jobs were available in Lahore and the schedule for written test and interviews are now announced by the officials. We will provide you the whole schedule that is announced we will also give the whole schedule and dates that are announced by the officials. These all posts are available in Lahore and the candidates who are related to Punjab province they can apply for this job and can be a part of this job. Now we will give you information about these jobs that are available and all those who applied will get the schedule for these jobs. Assistant chief district officer and this job is for BPS 18 and these exams and interview will be conducted on these dates 11-02-2019 time duration will be 90 minutes and reporting time will be 1:30pm and attendance time is 2:00 pm. Additional director jobs for BPS 18 is and these exams and interview will be conducted here on 11-02-2019 there will be both morning and evening session for this date, 12-02-2019 and this will be conducted for both morning and evening session. And timings will be same that are given above. Mines labor welfare officer for BPS 16 and these exams and interview will be conducted on 13-02-2019 there will be both morning and evening sessions available here. Assistant executive engineer this job is for BPS 17 and this interview and exams will be conducted on 13-02-2019 and the time duration will be same as given for assistant chief district officer. Additional solicitor these jobs exams will be conducted in 17-02-2019 and on 18-02-2019 and there will be both morning and evening sessions for this interview. This was information about Punjab public service commission PPSC announced written test date and exam schedule for February 2019. All those who was eligible when they applied for this job they was called for interview and test the candidates who will pass in it then they will be recruit for this job. And all of you have to keep visiting for getting the latest updates here and this information will be really helpful to you all. We will keep updating all the latest updates here for your help.